These drawings and explanations come from the first five or so Suzuki flute books where Marcel Moyse was the advisor. They are no doubt copyright, so I'll leave the jpegs up for a week or two, and then take them down, while you go and purchase the Suzuki books or library-order them to see the original drawings and explanations. 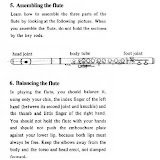 Meanwhile, this may help to explain several aspects of the flute (like headjoint line up and how to play pianissimo while staying in tune etc.) that many flutists don't realize have been explained by Moyse himself with pictures! I haven't tried embedding a link to web-albums before, but if you click on the picture below, you may find the slide show plays itself. Or try the picasa web album I made from these pictures, and click on SLIDE SHOW. Best, and hope this helps the discussion we've been having on Galway Chat this week about possible errata in De La Sonorite. I am using these Suzuki-Moyse pictures to cross-reference the De La Sonorite text. It's interesting that Moyse seems to advise closing the teeth to create pp as if biting it off. There's a conversation going on in "Galway Chat" right now, where we're discussing this kind of verbal description and whether or not it's accurate. One of the chief points being made is that Moyse was playing an "old scale" flute and may have needed to exaggerate lip and jaw motions because of the older style instrument's demands. Jennifer, there is a wonderful DVD created by Eleanor Lawrence on the entire book "De La Sonorite - L'art et Technique". This was one of the final projects she undertook. The first summer I studied with Eleanor she created a VHS of the summer masterclass where we studied in extreme detail 24 Petites Etudes Melodiques. It was Eleanor's wish to share all that she learned from her many years of study with Maestro Marcel Moyse. I highly recommend both of these items for use with students. She even discusses these issues with the class. It is a great watch! Thanks John; I have that DVD. Best, J.